It's quick, easy and full of healthy benefits, so what's not to love about oatmeal? 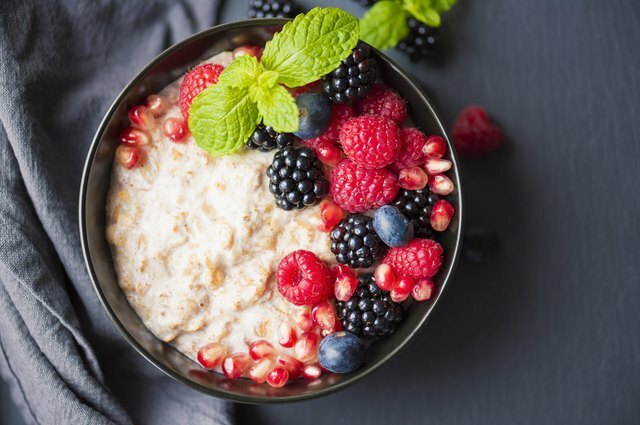 Plus, if you think of your mild-tasting, old-fashioned rolled oats as a canvas for creative toppings, that breakfast bowl can take on a different flavor profile every day of the week. The best news is that oats cooked in the microwave rather than on the stove take less time to cook, taste the same and don't result in a messy pot to clean. 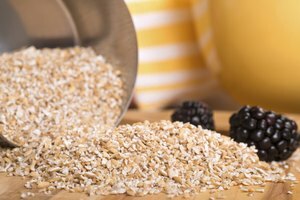 Rich in fiber, vitamin B1 and important minerals, oatmeal is one of the few processed foods that helps reduce the risk of heart disease. 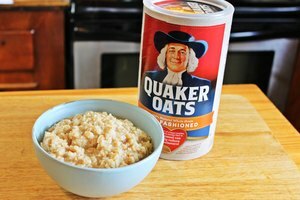 If you want to avoid the box of doughnuts in the lunchroom, begin your morning with a bowl of old-fashioned oatmeal. Hearty and filling, your morning bowl keeps mid-morning hunger attacks at bay. Begin with a standard ratio of 1 part oatmeal to 2 parts water. If you plan on adding lots of additional ingredients for more flavor and nutrition, try 1/3 cup of oatmeal to 2/3 cup of water. If you have a more hearty appetite, use a 1/2 cup of oats and 1 cup of water. Cook the oatmeal on high for 2 minutes in a somewhat deep cereal bowl. Decrease further the already-low sodium level of the oatmeal by avoiding any salt, or add just a pinch of salt to bring out the flavor of the oats. With a little trial and error, you can achieve perfection in your morning bowl of oatmeal. 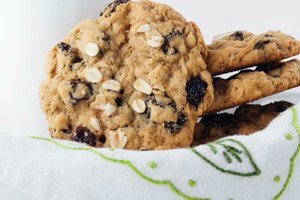 For thicker oatmeal, add a bit less water by filling your measuring cup somewhere beneath the rim or cooking your bowl for 20 to 30 seconds beyond the basic 2-minute recipe. For thinner oats, use more water. If you plan to add something that will thicken the oats, such as toasted wheat germ with its high levels of vitamins and minerals, use a few tablespoons more water. 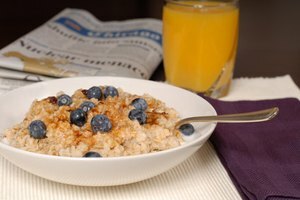 While old-fashioned oatmeal does contain some protein, you can always add more. Protein eaten in the morning gives your muscles a boost all day long. Plus, it adds both flavor and texture. A small handful of toasted nuts, a sprinkling of bacon bits or a tablespoon of peanut butter will do the trick. Or, use dairy milk, soy milk or another alternative milk instead of water for cooking the oats. If eating 2 cups of fruit each day (the amount recommended by the U.S. Department of Agriculture) seems like an impossible task, get a head start on the job by adding any kind of fruit to your oatmeal. Add frozen berries to the bowl before cooking or slice in a banana after the oatmeal comes out of the microwave. Add dried cranberries, raisins or any other dried fruit before cooking to soften it, or add it after cooking for a more chewy bowlful.